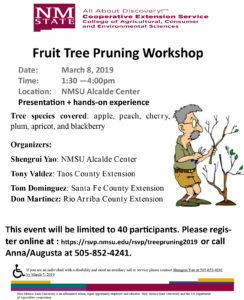 The annual fruit tree pruning workshop will cover most temperature fruit tree species like apple, peach, cherry, pear, plum, and apricot. We also cover blackberries and raspberries. We will have an indoor presentation first and then divide the group to different hands-on sessions and rotate sessions later. The event is limited to 40 participants. While it is not essential to prune a grapevine for it to thrive, pruning IS the one cultural activity that can vastly improve fruit production and quality from year to year. Learn not only when and how to prune your grapevines, but why. Part of the Vine to Bottle, Growing Grapes in New Mexico series. Presented by Dave Pojman, Sandoval County Master Gardener, as part of the Gardening with the Masters series.